Anyone who has experienced working and living in Manila knows that the big city can be too exhausting especially. While there is a long list of hangout hubs in this large metropolis for couples and families like shopping malls, food parks or museums, there are just weekends when you just want to feel the fun and freedom of travel and adventure. However, since work schedules often limit your free time, is there a way to have such an unforgettable getaway with the little time that you have? Well, the answer is YES. The natural beauty of Puning’s Hot Springs is actually an aftermath of a destructive natural calamity, the 1991 eruption of Mount Pinatubo. The site is just located at the foothills of the volcano and is now a well-established hot spring and spa destination. There are several affordable accommodations that cater to overnight travelers and guests near Puning Hot Springs and Spa. For top-rated hotels and inns, you may click this link here. Take the bus from Metro Manila to Pampanga, and get off at the Mabalacat Bus Terminal. From Mabalacat, take a jeepney or a tricycle to Clark (main gate) and another jeepney ride to the resort’s transport pick up location near Mini-Stop, Sutherland. From there, 4×4 vehicles will finally take resort guests to the Puning Hot Spring’s main entrance. For more details and contact information, refer to this link. The entire resort is composed of 3 stations: the main entrance with a reception area, the spa and relaxation area, and finally, the hot springs. The management offers a full package that includes a 4×4 ride to the hotel, meals, tour guide, spa services (massage, mud pack and sand spa), and access to the hot and cold spring. According to the latest information, the whole experience can cost 3,000 PHP – 3,500 PHP per person. 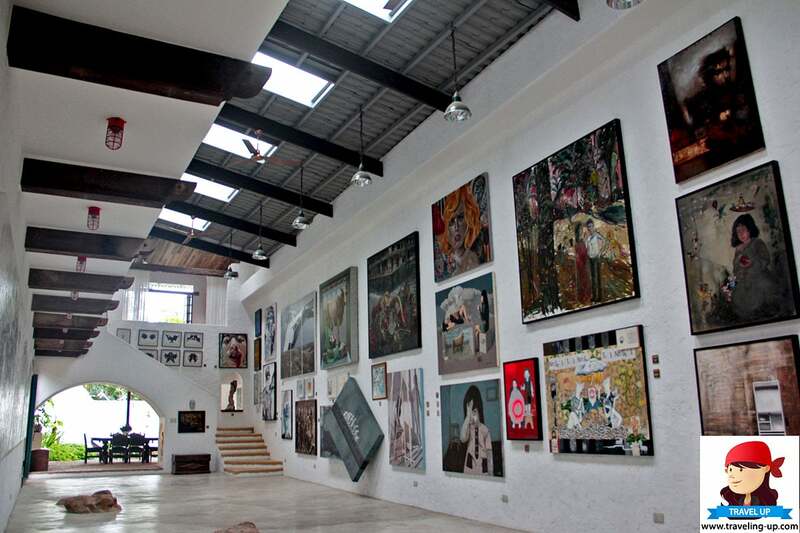 One of the unique art museums in the country is located in Antipolo, Rizal, where native and contemporary artworks reside. The entire museum compound is set on the side of a hill and all its artworks are housed in galleries inspired by Greek architecture. Anyone who loves art and nature will surely appreciate the lovely uniqueness of this must-visit destination which is just 21 kilometers away from Metro Manila. Here, you have a variety that rangers from paintings to sculptures. Also, the work presented here are those done by local artists. If you want to fully relax and temporarily get away from the hassles of the big city, staying overnight in Antipolo after visiting Pinto is a smart decision. There are several accommodations in Antipolo city where you can just relax and have a quiet time with your loved ones. Restaurants with observatories overlooking Metro Manila’s skyline can be found along Antipolo’s main highway. From Manila, there are several transportation options that you can choose from. The most convenient is from Ayala, Makati where you can board a van or FX vehicle that will take you directly to Antipolo’s town church, locally known as “Simbahan”. From Simbahan there’s a line of tricycles (fare is 40 PHP – 50 PHP) that will take you to Grand Heights Subdivision where the museum compound is located. The museum is closed on Monday and is only open from 9:00 AM – 6:00 PM. There is a restaurant located within the museum compound where guests can order delicious and relatively affordable meals. Entrance fee is 200 Philippine Peso for regular/adults while senior citizens and PWDs can enjoy a 10% discount as long as they have their ID cards with them. Student IDs are honored and holders will enjoy a 50% discount. Food and drinks from outside are not allowed; they have a “baggage counter” where you can leave your things if you don’t want to carry them around the museum. Just like any museum, camera flashes are NOT allowed when taking photos. For more details, you may contact them here. 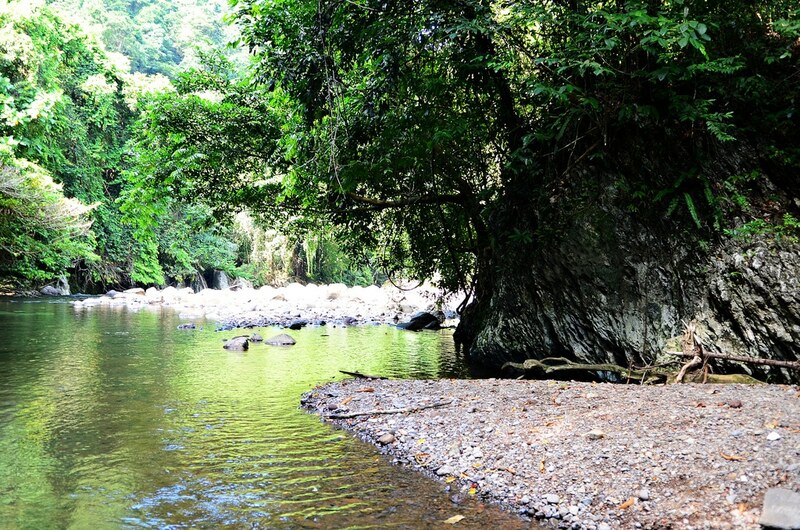 Cavinti is a home to one of the country’s ecotourism destinations. The site offers an adventure like no other, with its underground river and caves complex that helps travelers and adventurers appreciate the beauty of what nature has to offer. The experience includes an orientation and exploration where guests can learn more about these mesmerizing cave formations as well as preservation efforts by the site’s management team. According to locals, the cave complex was accidentally discovered by a farmer one day when he was on his daily hike to look for firewood. This happened just a few years ago and in fact, the whole area was opened to the public just in 2013. Cavinti’s cave adventure is not for the faint of heart and you’ll need to fully prepare yourself for your trip head. Accommodations around the town are available for solo or group or weekend stays. Here’s a helpful list of hotels near Cavinti, Laguna that you can check out. From Manila, take a bus bound to Sta. Cruz Terminal in Laguna. From the terminal, board a jeepney going to Cavinti’s Poblacion. The whole jeepney ride will take almost an hour. Then, take a tricycle to the Bumbungan Eco Park where you can finally ride a 4×4 car to the cave’s Guard Post. For a detailed guide that can help you plan the trip, you may contact them here. Exploring the cave complex needs an upper beginner to intermediate spelunking experience, so this site is a perfect place for adventure seekers who want to add an item to their bucket list. It’s advisable to bring your own packed meals since the trip, including transport, can take to up to 6 hours and there are no commercial establishments near the site. Travel responsibly and respect the place – listen to your guide at all times. Hopefully, this list of overnight destinations near Manila will help you have the best weekend of travel, adventure, and relaxation that you truly deserve. Many Filipino beach lovers always look forward to the Philippine summer season because aside from the fact that gloomy rainy days are over, they can finally realize their highly anticipated travel goals to their most favorite island destinations. Indeed, summer in the Philippines is the most awaited time of the year for these sun-worshippers and several known places often come to mind when asked about their ideal beach destinations: Boracay, Palawan, Puerto Galera, and many more. While there are popular destinations in the country for beach fun and underwater adventures, did you know that there are also several emerging beach destinations that you can add to your bucket list? Here’s one of the top picks for you. While Boracay and Palawan attract millions of tourists each year because of their fine white sand and clear blue waters, Sila Island holds its own charm and uniqueness – it’s one of the few places in the country where you can experience a magical shoreline which sands shimmer in a pinkish hue. 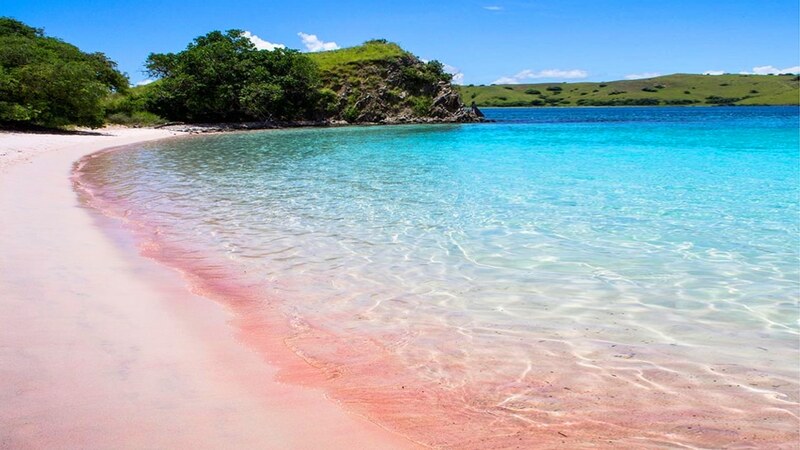 Aptly nicknamed the “pink beach” by locals and travelers alike, this amazing destination is still untouched by the damaging effects of over-commercialization. For this reason alone, it’s a perfect choice for your next summer adventure especially if you want to experience the humble perfection of this emerging island paradise. Trivia: How did Sila Island’s powdery sand get its color? 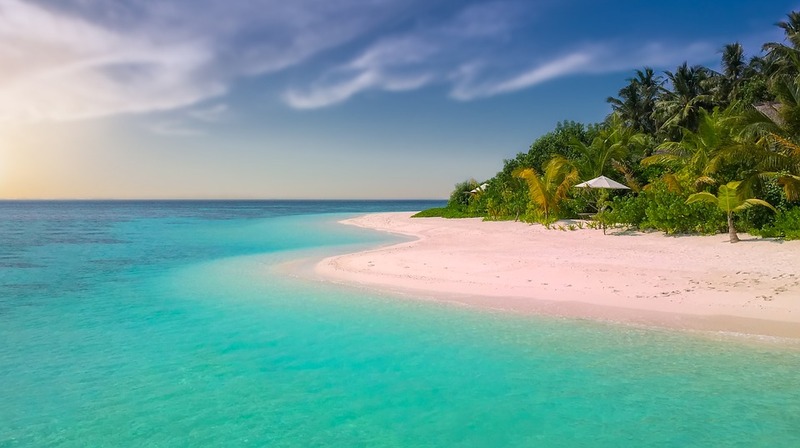 The pinkish hue of the island’s sands comes from the natural colors of coral and shell fragments. These finely pulverized materials, through thousands of years of process, have been mixed with the originally white-colored sand of the island’s shores. During mid-day when the sun is at its hottest and brightest, the beach reveals another more saturated reddish shade. Sila Beach is located in Northern Samar on the eastern portion of the island-town, San Vicente. Northern Samar is one of the provinces in the Eastern part of the Visayas. 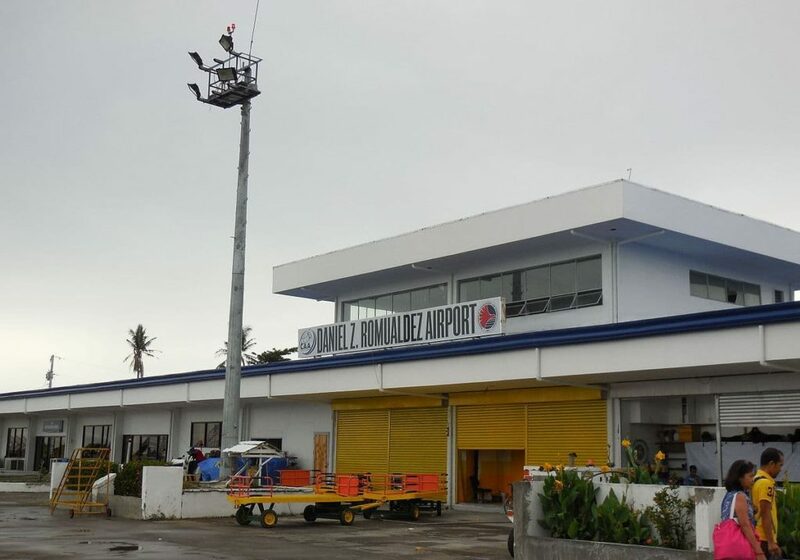 Catarman has one small semi-active airport (the nearest to Sila Island) that caters to one airline company, Philippine Airlines. There are also chartered jets available from Cebu, Davao, and Manila. However, flying directly to Catarman from Manila is not a practical option for budget travelers especially if they don’t want to spend too much on plane tickets alone. From Catarman, you have to take another van service to reach Calbayog, the nearest city to San Isidro, the jump-off point to San Vicente. 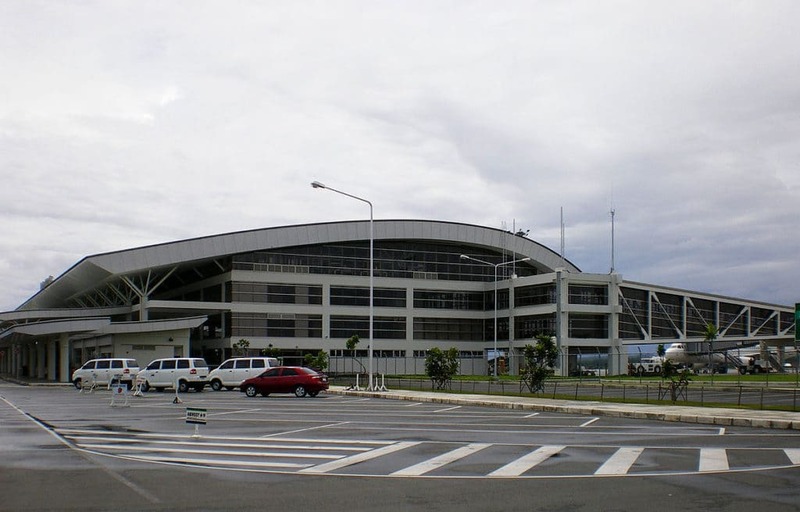 Tacloban’s airport offers cheaper ticket prices and serves three major airline companies: Cebu Pacific Air, Air Asia, and Philippine Airlines. From Tacloban, there are vans going directly to Calbayog, Northern Samar with an estimated travel time of 4-5 hours with a fare of 25o PHP – 300 PHP). Upon arriving at Calbayog City, take another van to San Isidro where you can find boats going to San Vicente. Boats going to San Vicente leaves at 7a.m. and 2 p.m. (trip schedules may change so plan accordingly) every day from Monday to Saturday (fare is at 100 PHP). Of course, schedules will depend on the weather. From Manila, land trips and sea travels going to Sila Island in San Vicente offer more affordable options. There are bus companies which routes can take you to Bulan, Sorsogon (fares for air-conditioned buses may vary, but it usually starts at 400 PHP – 1,000 PHP). Upon arriving in Bulan, Sorsogon, you can either walk or take a local ride to the town’s port. From the port, you can hire private boat services to take you to Sila Island. This is an option for group travel, especially if you want to explore two popular Philippine destinations at the same time, Sorsogon, and Northern Samar. Prices are negotiable and will be based on the terms that you’ve agreed with the boatman. Direct bus companies offer trips from Manila to Calbayog, the nearest Northern Samar town to San Vicente Northern, Samar, the jump-off point to Sila Island. For more details and ticket prices, you may visit this useful link here. Boat rides to San Vicente from Calbayog can take up to 45 minutes. 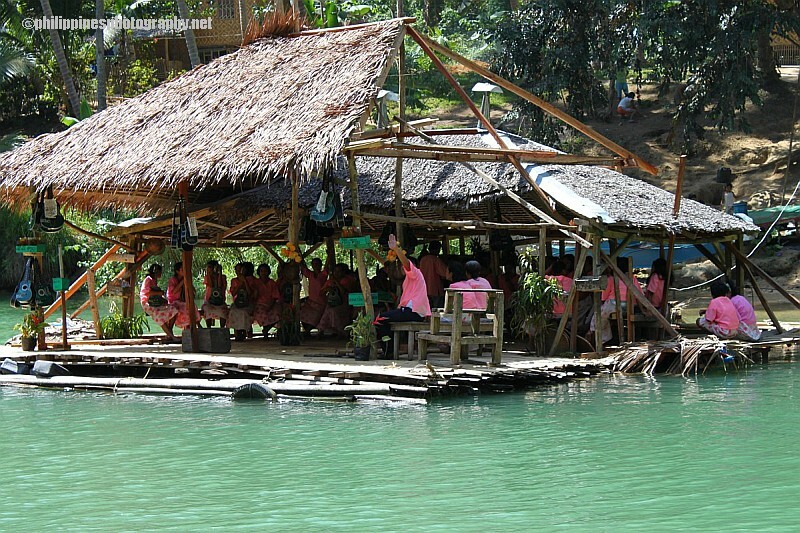 As mentioned above, boat fare costs 100 PHP per person. Sila Island is lined with sturdy red and black rock formations that add allure to the paradise’s pink shorelines. While the facilities on this island are limited, it can be a haven for free divers and snorkelers alike. Beach bums can also enjoy a relaxing day under the sun. Since Sila Island is not an established island-resort, they don’t have similar accommodations that you can find in other PH beaches. Instead, they have bamboo kiosks for a comfortable day at the beach for groups. Camping out is an option if you want to spend the night on the island as long as you observe cleanliness – and it means leaving no trash behind. Pink island locals have built toilets for the day and overnight travelers so you don’t have to worry about this aspect of remote-island adventuring. It’s advisable to bring your own food and refreshments from the nearest city since there are no stores and commercial buildings near the beach. While it can be an unforgettable adventure to be one of the first travelers who can set foot on this paradise, it’s important to remember these three things: travel responsibly, respect the culture and the beliefs of the locals, and most importantly, have fun. Located in the central part of the Visayas, Bohol is one of the key destinations in the Philippines that have long mesmerized local and international tourists because of its rich variety of sights, sceneries, and experiences from the island’s best offerings: diving hubs, historical sites, beach resorts, hiking spots, and a sanctuary of unique animal species. Unlike other tourism centers in the country, the island offers an all-in-one travel experience that cannot be found in any destination in the Philippines. If you’re planning to travel to Bohol for the first time, read on and learn more about this must-see paradise. Bohol is a haven for all types of travelers: whether you’re a history geek, nature lover, animal conservation advocate, sea world enthusiast, hiker, diving nomads, or just a random backpacker, the island has everything you need and more. It’s called “God’s Little Paradise” because of the island’s mysterious and charming locations, scattered across the region. What the island offers, both natural and man-made, cannot be compared with other Philippine tourist destinations – and once you’re there, you’ll find out why. Bohol is the 10th largest among all the Philippine islands. The main region is surrounded by smaller bodies of land where Bohol’s white sand beaches and diving sites can be found. Since the province’s territory is so huge, the attractions can be kilometers to miles apart from one another. 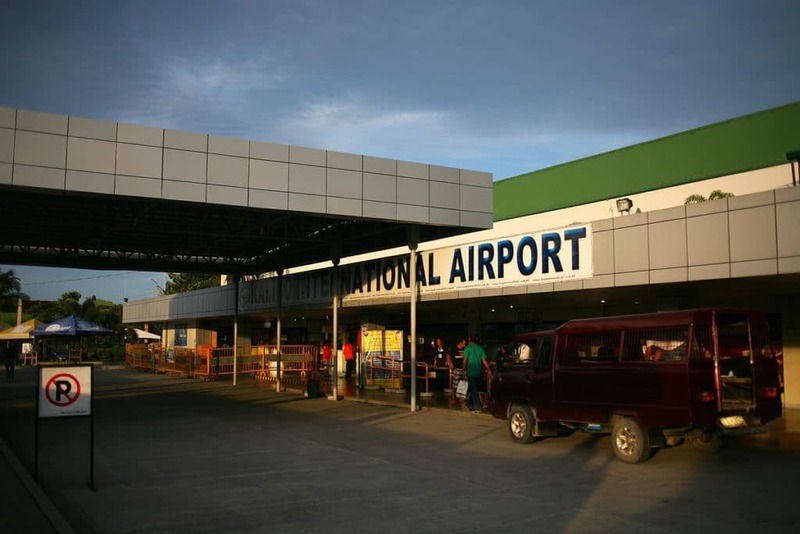 Bohol has one airport located in Tagbilaran, a component city in the province. 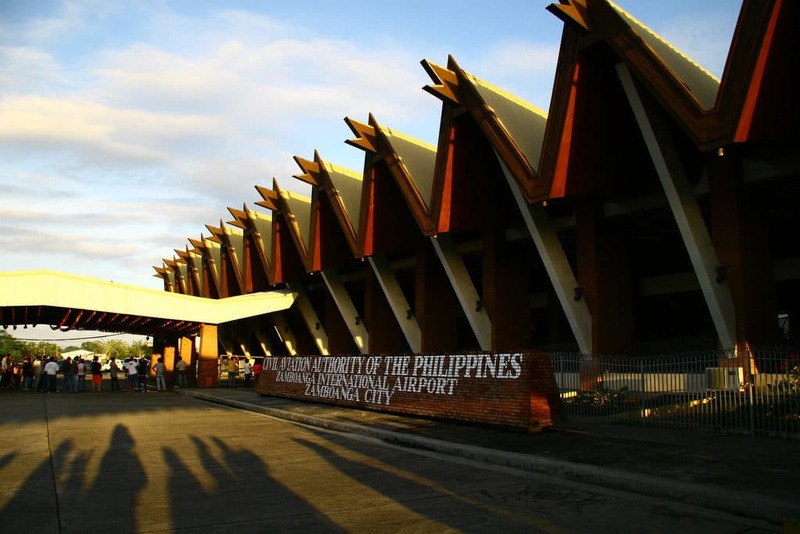 Three of the country’s airline companies operate to and from Tagbilaran airport: Cebu Pacific, Air Asia, and Philippine Airlines (PAL). 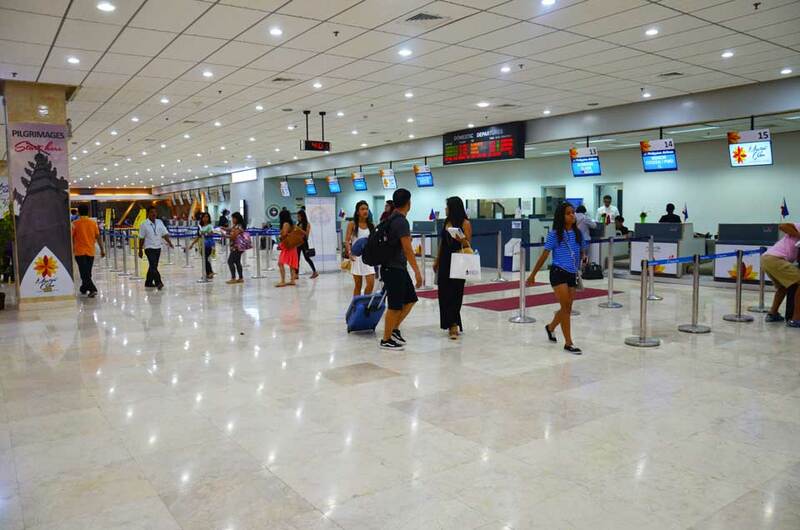 While most of these airlines fly directly from Manila to Bohol, connecting flights coming from Cebu City can also be availed. Since Bohol is a main island in the country, several ferries and fast crafts companies operate on a daily basis, and most of them are from Cebu ports to Tagbilaran, vice versa: Ocean Jet, Lite Ferries, and 2GO. Cebu-Tubigon ferry routes are also offered by the Lite Ferries company, with several trips every day. Pro Tip: It’s highly recommended to book your tickets in advance especially if you’re visiting Bohol during the peak travel season (March-April). Pro Tip: Months from June until December covers the country’s rainy season so it’s not advisable to travel to this island destination – especially if it’s your first time to avoid a stressful (and not to mention soaking) travel experience. How does a first-time traveler navigate a large island-destination like Bohol? It depends on your itinerary and what you’re planning to do for the rest of your trip. While it can be time-consuming to travel around the island, mapping out your trip early on can save you a lot of travel. 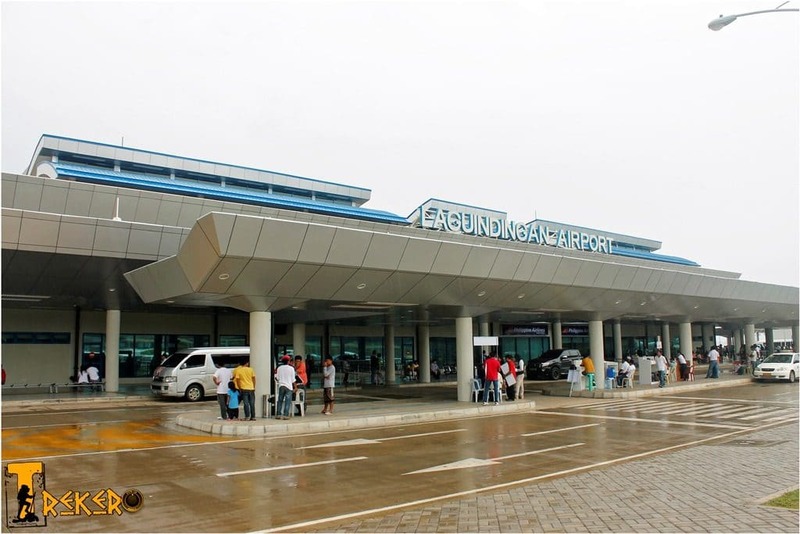 There are different transport options that you can hire once you arrive at Tagbilaran airport. 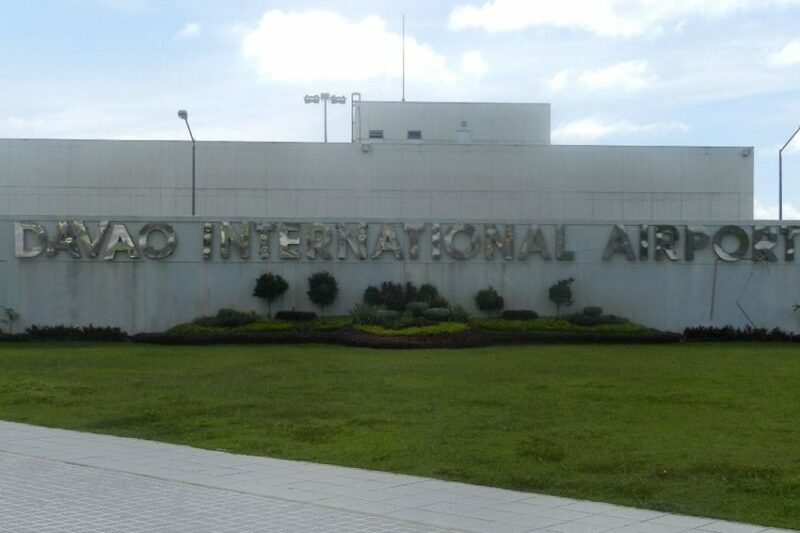 As soon as you step out of the airport building, you’ll be greeted with friendly and eager faces from local tour guides, van-for-hire service providers, and also hotel welcome staff. Hiring a taxi – take note that this option is the most expensive but also the most convenient. You have to negotiate for a reasonable rate with the driver before closing the deal. Hiring a tricycle (800-1,000 PHP) – local tricycle drivers may offer reasonable rates but there are limits to where this option can take you. Hiring a private van – there are fixed rates when hiring private vans, and most services even offer their own itineraries. This is a practical option if you’re with a couple of friends or family members. Pro Tip: IF you are a solo traveler and you know your PR skills, you can also share van service with other people and split the price. All you have to do is to ask around and get a nice deal. Private car – if you have your own vehicle, then you’ll have the freedom to explore the island at your own pace. You don’t have to worry about directions – every smartphone has a GPS program that you can easily use to navigate the entire province. Jeepneys, Philippine’s local public transport vehicles have routes from Tagbilaran to other major Bohol towns like Carmen, Jagna, and Baclayon, where most of its tourist attractions are located. The fare would depend on the distance per kilometer, but you should expect this option to be overcrowded and most of the time uncomfortable – especially if you have several bags with you. Bohol has a long list of mouth-watering and appetizing delights that can be found in every major town in the province. In fact, some of these delicacies unique to this part of the Philippines have received international recognition because of their heavenly flavors. Bohol is surrounded by smaller islands and is a home to several species of marine creatures. The abundance of these resources makes the region one of the biggest suppliers of fresh seafood in the country. That’s why it’s no surprise to find several seafood restaurants scattered around the province. For a complete list, click this link here. 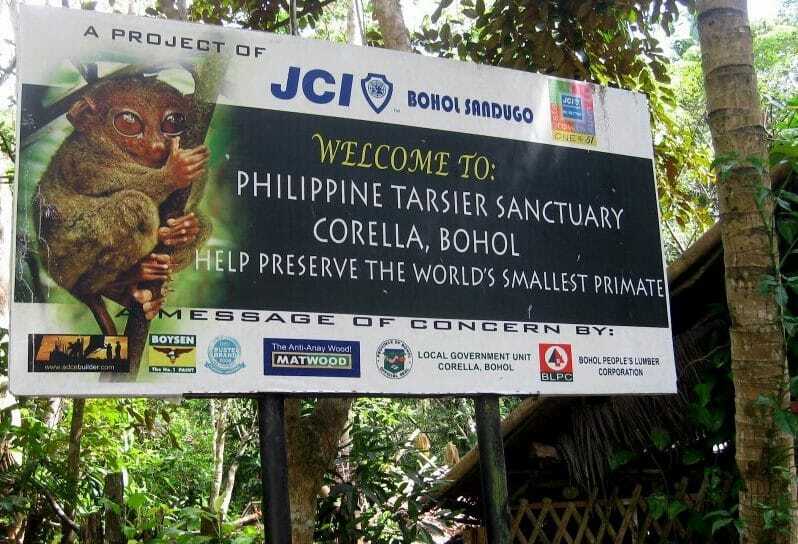 There are different Tarsier sanctuaries in Bohol and one of them is near Corella. What makes this one special? It’s actually the only place on the island where tarsiers and a few other animals live in the wild and not in cages. Moreover, at its center also lie two old churches, the San Pedro and Baclayon church, reminding the locals of their Spanish-era history. 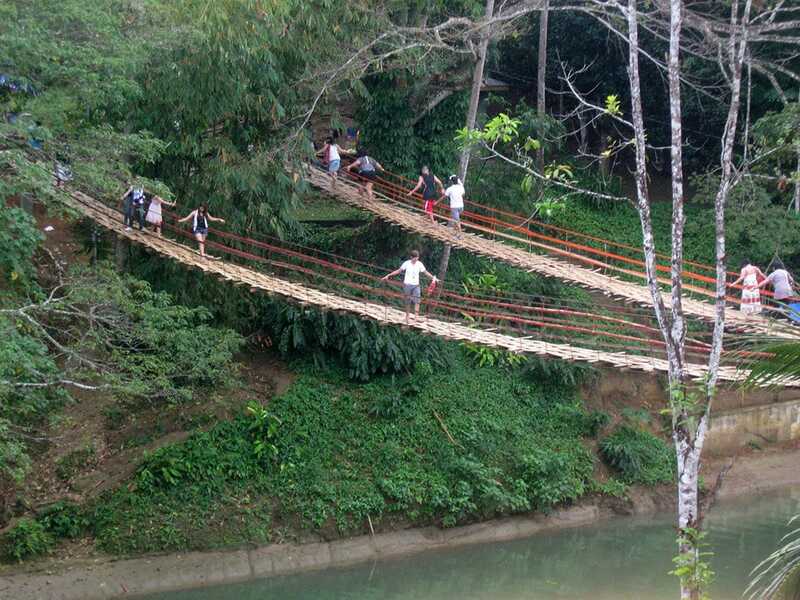 Bamboo Hanging Bridge in Loboc, which streaches accross the Loboc River, is a popular attraction visited by tourists. The Hanging Bridge hangs about 25 meters above the river and spans around 40 meters. The entrance fee is P10.00 for those who don’t live in the Barangay on the other side. 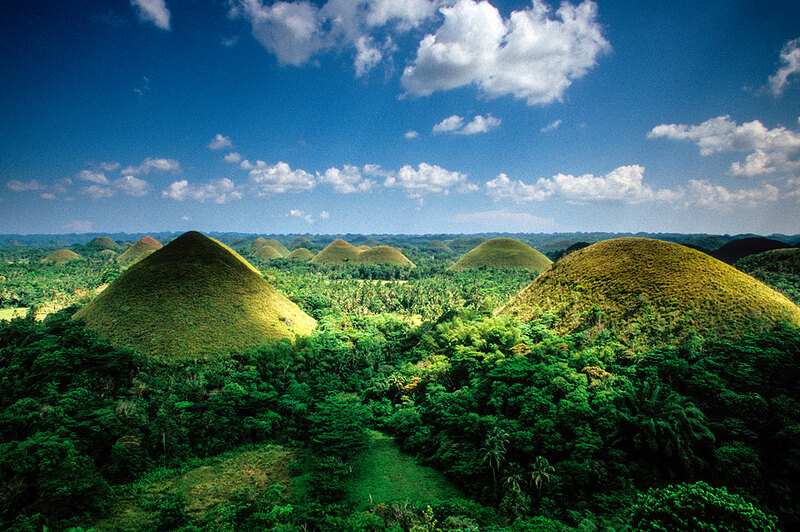 The Chocolate Hills are the most iconic attractions in Bohol. The site is made of bizarre hill formations of over 1,700 conical-shaped landforms (30-120 meters in height). It’s located in Carmen, which is approximately 55 kilometers away from Tagbilaran. Aside from these common tourist spots in Bohol, there are several white-sand beach resorts around the province, with the most popular destination, Panglao. Exploring and experience this paradise needs more than a day or two of travel so make sure you properly manage your time and financial resources before finalizing your trip. The Philippines is a home to many island-paradises that have amazed and awed travelers around the world for many decades. Wherever you set foot in this beautiful country, you are assured with the promise that every adventure will be unforgettable – especially if you get the chance to explore the mesmerizing eco-tourism haven that is Puerto Princesa in Palawan. 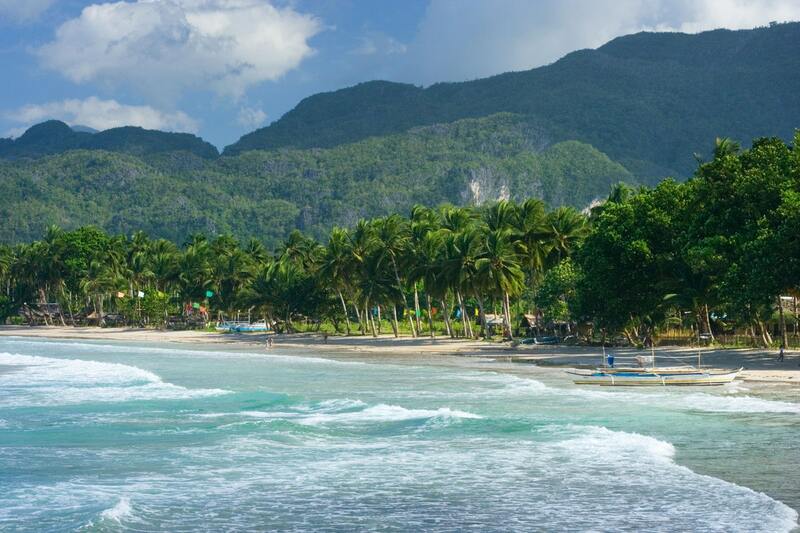 Located in the Western region of the Philippines, Puerto Princesa is one of the major cities on the island of Palawan. Although it’s a coastal city, it’s largely known for its huge limestone caves and most especially, its world-renowned underground river, Puerto Princesa Subterranean River National Park, a UNESCO World Heritage Site. The coastal areas are popular sites for diving and other underwater adventures. Among the several underwater creatures found in the region are long-nosed dolphins, rays, and several species of turtles. Historically, this island-paradise was named after a Spanish princess, Princess Asuncion who died at an early age. 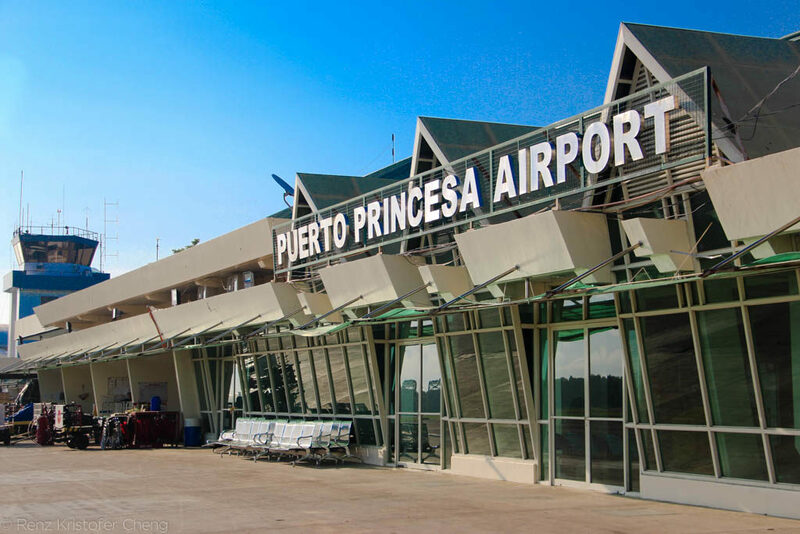 The place was later renamed as Puerto de la Princesa, and is known today as Puerto Princesa. Puerto Princesa’s city center only covers a small part of the entire island, but the whole city is geographically the largest (compared to El Nido and Coron) in Palawan. Because of this, first-time travelers should remember that the main attractions are usually far from each other. While it’s advisable to contact tour operators to help you explore and get around the city, a DIY itinerary is still doable – if you’re good at time management and have excellent navigation skills. Several airline companies (Cebu Pacific Air, Philippine Airlines, AirAsia) offer daily flights to Puerto Princesa from Manila, Philippines’ capital city. In addition, the island is accessible through several other Philippine cities: Cebu, Iloilo, Davao, and Clark in Pampanga. Flights, including transfers from the airport to the city center, can take as long as 3 hours (approximately). Pro tip: Planning your trip to Puerto Princesa a year in advance can save you thousands of pesos, especially if you’ll be traveling with your family. How? Promo flights from two airline companies (Cebu Pacific and AirAsia) can plunge as low as PHP 1 (excluding taxes and fees). A Philippine shipping company, 2GO Travel, offers ferry trips from Manila Pier 4 to Puerto Princesa (via Coron). However, the trips’ schedule is limited to only twice a week with a travel time of 31 hours and 30 minutes. Depending on the type of ticket available (Tourist Class, Super Value Class), prices can range from 1,500 to 3,500. Pro Tip: You have to book your tickets in advance especially during peak travel months such as April and May (the “summer” season in the Philippines). Furthermore, expect more foreign tourists during Western summer months like June and July. As what was mentioned earlier, Puerto Princesa covers a large geographical area, with several tourist attractions that are miles apart. For beginner and first-time travelers, the most efficient and hassle-free way to explore the attractions are to hire a private van or avail of transfer services especially if you want to maximize your stay and visit several destinations in a day. Pro Tip: Hotels and accommodations have their own recommended van transport providers. However, it’s more practical to do your research first and read reviews online before hiring a specific service provider. Within the city proper, tricycle services are also available (fare can range from PHP40-50 depending on the distance). This type of public transport can take you around the city especially if it’s your first day and you want to look for a great place to eat. Puerto Princesa is famous for one of its most in-demand delicacies, Hopia, a type of baked good. Several local stores sell Palawan’s famous hopia in Puerto Princesa, with a wide variety of flavors to choose from. For a full meal, there are several restaurants in the city that serve Filipino and foreign dishes. Since it’s a coastal town, expect fresh and affordable seafood offered almost in every major food hub. For a complete list of highly-recommended places, check this page out. Puerto Princesa is one of the few places in the country where nature and progress have successfully flourished together, no wonder it’s considered as Philippine’s eco-tourism center. For first-time travelers, here are some of the few tourist attractions in Puerto Princesa that you shouldn’t miss on your first day. Puerto Princesa’s Sabang Bay is a natural museum of magnificent rock formations and majestic limestone cliffs along its long shorelines. Aside from that, cruising along its long line of beaches and coves, as well as its crystal clear waters will give a surreal and unforgettable experience that you’ll never get anywhere else. 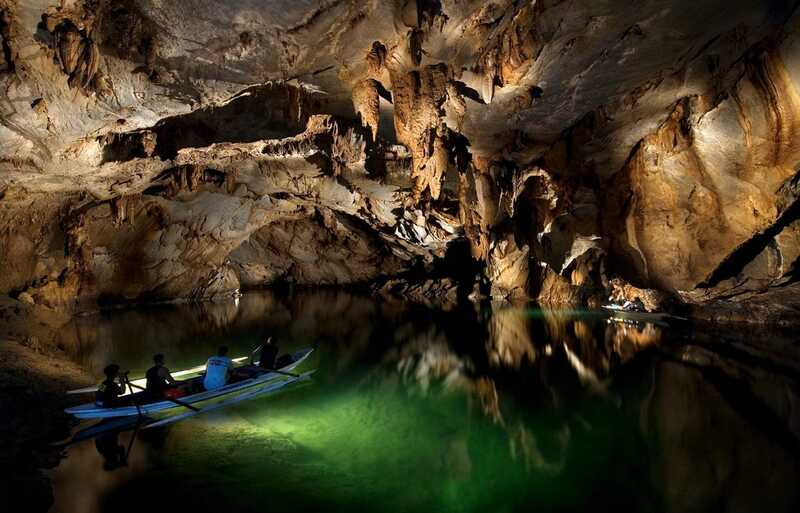 One of the major reasons why travelers choose Puerto Princesa than any other island-destinations in Palawan is because of its famous Underground River. Named as one of the New 7 Wonders of Nature, it offers a mesmerizing view of enormous stalagmites and stalactites. The experience itself is both informative and enchanting, as tour guides will walk you through the historical, cultural and geological significance of the site. 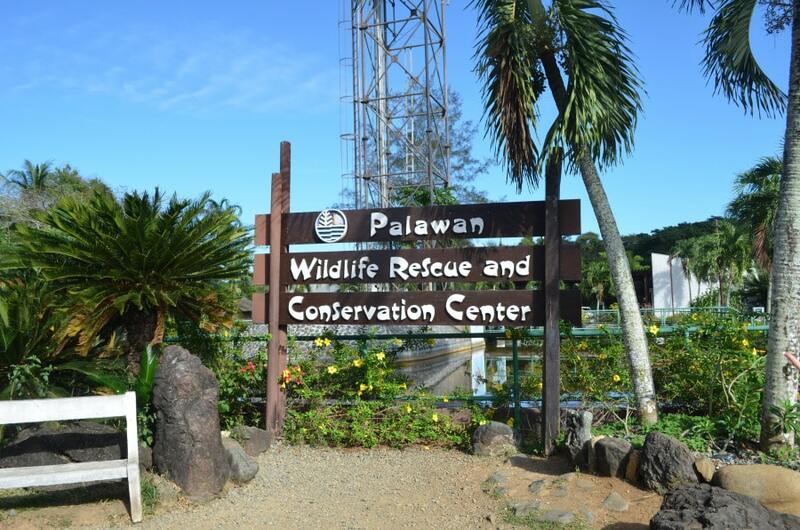 Puerto Princesa is a sanctuary to many wild animals in the island and thanks to the local government’s support, the Palawan Wildlife Rescue and Conservation Center are able to provide a safe refuge to different species of animals like crocodiles, porcupines, Bearcats, and different types of birds. Whether you’re in Puerto Princesa for an awesome underwater fun or a thrilling nature-wildlife adventure, you’re sure that you’ll have a blast. So if you’re planning to explore everything that Palawan has to offer, this island paradise is the best place to start. The Philippines is a tropical country and anyone who has lived long enough in this part of Asia will agree that the hottest times of the year can be unbearable – especially if you’re not a big fan of summer outdoor adventures like going to the beach and enjoying the sun. If you’re one of these poor souls, don’t worry. You can still find your own refuge this summer and experience the best that nature and culture have to offer: by going up north. 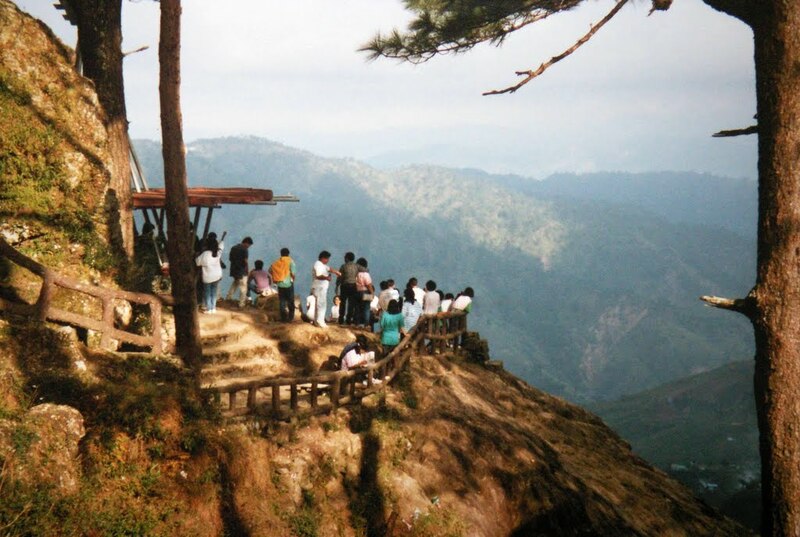 Baguio City, the “City of Pines”, is a “comfortable” holiday destination located in the Province of Benguet. It’s also known as the “Summer Capital of the Philippines” because of its ideal weather especially for city folks who just want to take a break from the oftentimes excruciating summer heat. The temperature can plunge to as low as 7-8 degrees Celsius. The city is approximately 250 kilometers north of the Philippine capital, Metro Manila. More specifically, it is located on a plateau (1,500 meters high) and is one of few developed cities around this mountainous region. It’s basically a university town and a mountain-resort in one, but it aside from that, it has a long and rich history that goes back to the pre-colonial period. In fact, its century-old houses and native establishments are witnesses to its colorful story. 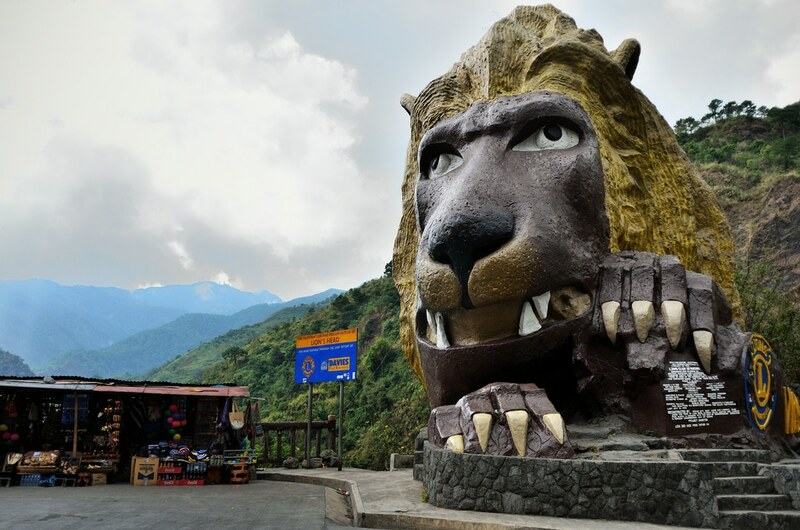 Traveling to Baguio city and its nearby towns can be intimidating especially if you’re not used to the long drives or if you easily get car sick. However, don’t let this prevent you from having the best time because the trip will be surely worth it. Face your fears and get started on mapping out your trip to this cold and cozy northern paradise. Are you ready? Here are the basics that you should know before traveling to Baguio City. If you’ll be coming from Manila, there are several options that you can take in order to get to Baguio. Depending on how much you’re willing to spend and how much free time you have on your schedule. Terminals Located in Cubao, Pasay, and other parts of Manila. Buses going to Baguio can be divided into two categories: regular aircon and first-class. If it’s your first time to travel to this part of the Philippines, choosing the latter should be your top option. Why? First-class Baguio trips only take 4 hours (instead of the usual 8-hour trip) because they have access to a shorter and naturally faster route. Another plus is, bus companies offer extra services such as a special waiting area (airconditioned room, free coffee/water, and comfortable seats). On the road, they offer snacks and refreshments. They also play HD-movies as part of their on-trip entertainment. Lastly, their seats are equipped with charging outlets so you don’t have to worry about empty batteries for your phone and other gadgets. Pro Tip: REMEMBER to buy/book your tickets in advance (1-2 months earlier than your planned trip) especially during holiday seasons and long weekends. Trips start as early as 1:00 AM but you can still catch one leaving as late as 11:55 PM. This is a smart choice for spontaneous road trips with your friends and family since seat availabilities can be secured even without advanced reservations. The bus will make several stops to pick up a few passengers along a busy major highway, so the travel time takes longer and, depending on the time of the day, heavy vehicle traffic may cause further delays. Most seasoned travelers usually take the night bus so they won’t even notice the long hours on the road. Pro Tip: For trip schedules (Regular Aircon and First-Class), you can check out this bus company here. Baguio City is a small yet vibrant town. Hotels and other accommodations (inns, Airbnb, hostels, dormitories) are available at the city center or nearby towns. Most tourists within the downtown area usually explore the sites by walking and enjoying the comfortable weather. However, for some destinations that are kilometers away, there are taxi services available (usually will cost you less than a hundred pesos for if traveling within the city). Because of its cool and comfortable weather, Baguio and its nearby towns are the country’s top producers of agricultural products such as fruits and vegetables. That’s why it’s so easy to find food spots that offer the freshest salads for veggie-lovers out there, and a whole selection of fresh-fruit flavored desserts in almost every restaurant. Whether you crave classical dishes or mouth-watering comfort food, there are a lot of amazing finds in Baguio that will surely satisfy your hungry tummy. For a romantic and cozy coffee date, there’s a good list of interesting coffee shops around the city that will surely make your afternoons unforgettable. Baguio City was one of the tiny colonial settlements established by the Spaniards in 1846. However, aside from its rich history, its natural environment has caught the attention of travelers, artists, and nature-lovers from around the world. It’s one of the most iconic destinations in Baguio. The Lion’s Head, as its name suggests, is a 40-ft statue of the head of a lion. It’s the first tourist attraction to welcome travelers since it’s located along the major highway that leads to the city proper. 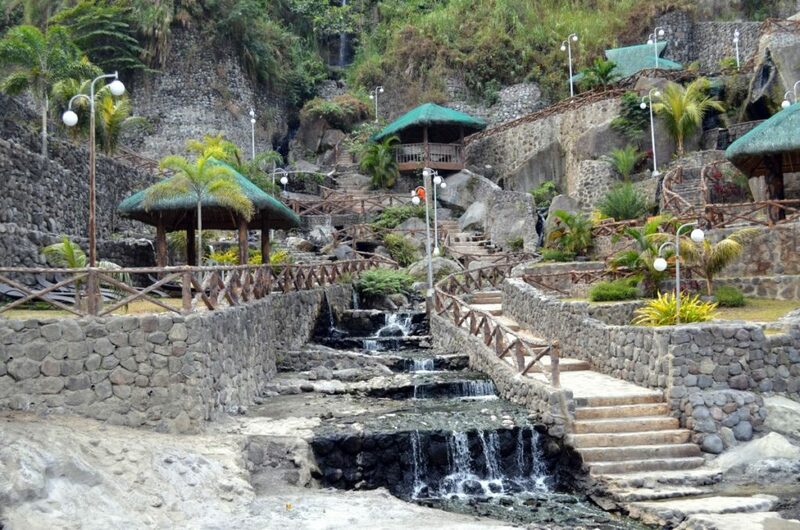 The park is actually an observation deck that offers a breath-taking view of the nearby former Gold and Copper mining town of Itogon as well as the Amburayan Valley. It’s a must-visit if you’re on your first day in Baguio not only because of its picturesque scenery, but also because of the small stores surrounding the area that sell souvenirs, native crafts, and even potted plants such as beautiful flowers and succulents. 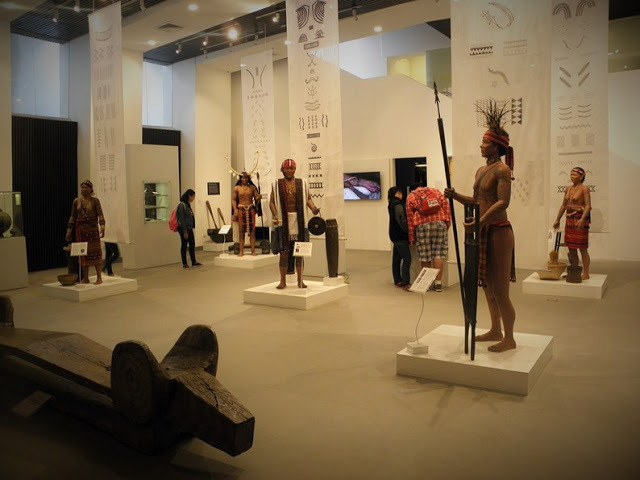 Baguio is a favorite destination for history and culture enthusiasts who want to experience the living and breathing richness of the province’s indigenous traditions. Museo Kordilyera, on the other hand, celebrates the cultural identity of the region by providing a place where they can collect, preserve and exhibit the objects and other artifacts that emphasize the uniqueness of the story and history of their people before the colonial era. Indeed, Baguio City is a magical place where history, culture and natural beauty come together to create a northern paradise that will give you the experience of a lifetime. Cebu City has one of the fastest emerging economies in the Philippines, but that’s not what the whole region is known for especially if you ask the millions of local and foreign tourists who frequently visit this central Visayan destination. Cebu City is a first class municipality located in the province bearing the same name, Cebu Island, in the Central Visayas. It is officially recognized as a high-urbanized city with a population of over 900,000, according to the 2015 data. While all these information can be easily found online, many people – even those who had the chance to visit this tropical destination often ask: why is it called the Queen City of the South? The title is attributed to its potential as a rising economic power not only in the Visayas but in the entire Philippines. As mentioned at the beginning of this article, it has a booming economy that promises the city’s crown to the royal throne of progress. If it’s your first time traveling to Cebu City, you may have a few questions about the basics yet important details that you should know about before booking that plane ticket. Just like any holiday trip, the first step that you should take is to do your homework. If you’re a Filipino or a foreigner who lives in another part of the country, you have different options to choose from if you want to get to Cebu City. Depending on where you’re coming from, the minimum traveling time can be as short as 1 hour. Local travelers have several options: plane, ferry, or private car. 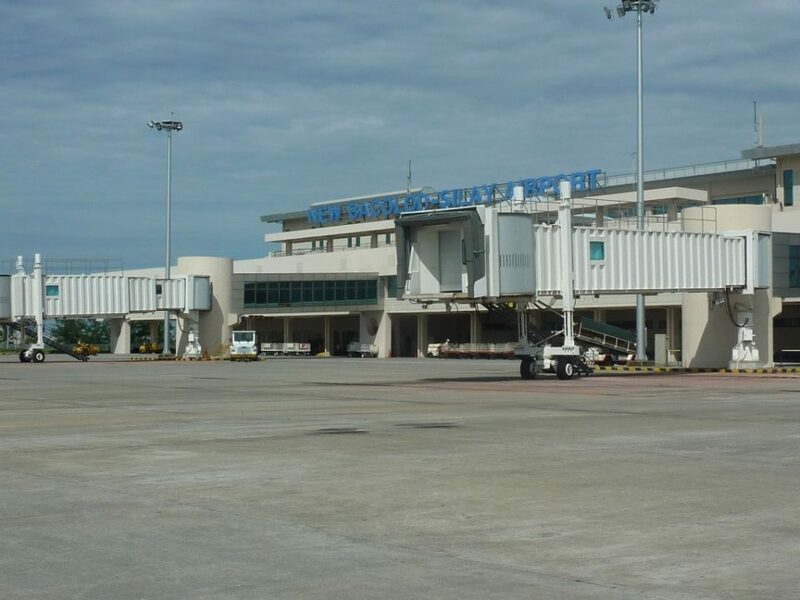 For international and foreign travelers, Cebu island is the home to Mactan International Airport, catering to local and direct international flights from other major countries in Asia. 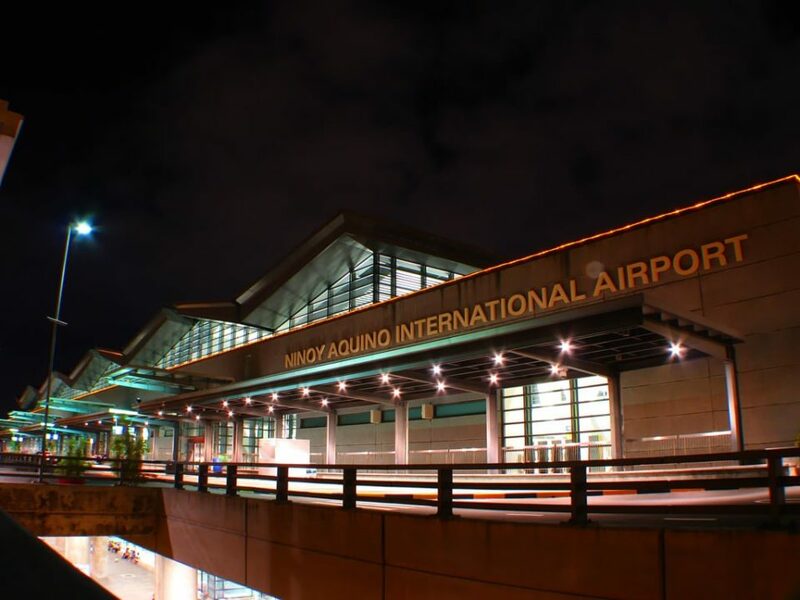 The airport is located in Lapu-Lapu City (30-60 minutes away from Cebu City). From the airport, taxi services (200-300 pesos depending on the traffic situation) are available and will take you to the city proper. Pro Tip: Two of Philippine’s aircraft carriers offer promo flight tickets on special occasions (New Year, Christmas, National Holidays) so you should be on the lookout for these deals online or on their website. A cheaper method prescribed by locals is the bus service, MyBus (located near the Arrival exit doors), which leaves every 20 minutes and will take you to SM City, Cebu where you can take other modes of transportation to your destination within and outside of the city. Going around the city is as easy as ABC – no pun intended. “Jeepney” and “multicabs”(local public transport vehicle) routes are classified according to different letter-number combinations like 03A, 02B, 01C, and so on. You can find the detailed information and their updated routes on this page. Cebu City is a heaven for foodies and food adventurers especially those who are crazy about fresh and affordable seafood meals – and you can never find this opportunity in other major cosmopolitan Philippine cities. This is because Cebu City is a part of a bigger province that is composed of over 160 smaller islands. In fact, the region itself is known for its several fishing villages. Aside from its local delicacies, there is a long list of restaurants serving international cuisines like Korean, Japanese, Italian, and even Middle-Eastern food places – but nothing beats the juiciest and tastiest lechon Cebu, or roasted (whole) pig. Cebu’s lechon is not only the best roasted pig in the Philippines, but is also the best in the world, according to the internationally acclaimed chef, Anthony Bourdain. 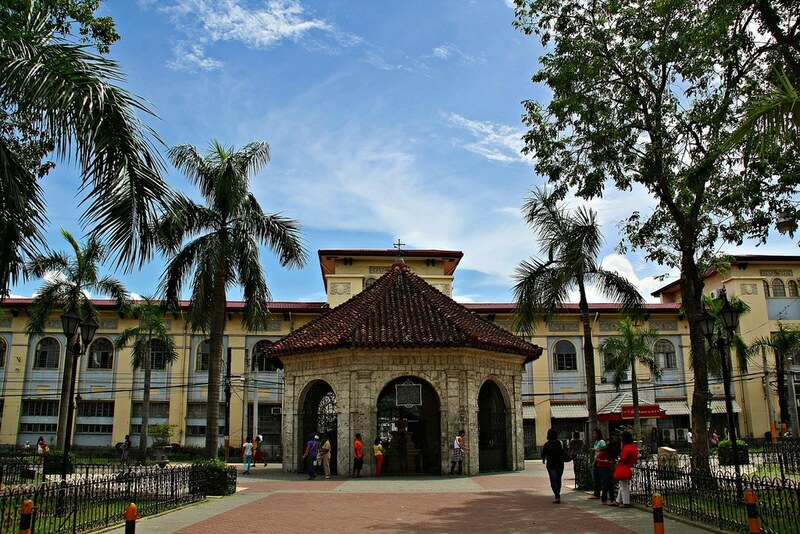 Did you know that Cebu City is the oldest city in the Philippines? It is also recognized as the very first island where Spaniards built a settlement before establishing a solid control over the country centuries ago. Their long and rich history makes the city interesting not only for history geeks but also for curious travelers. There is a long list of Spanish-inspired government and religious establishments around the city, as well as residential buildings designed after Spanish architectural styles. However, what catches most of its visitors’ attention are the mighty and still standing post-war memorials located at the heart of the city. 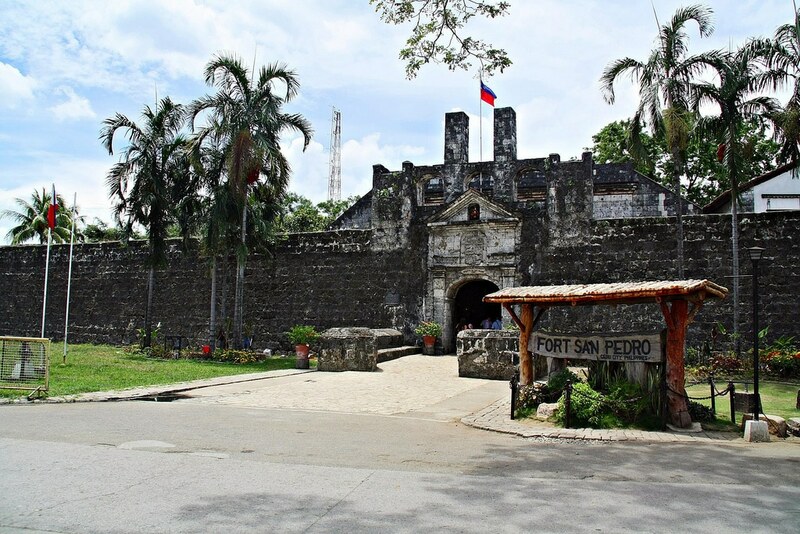 Fort San Pedro is the oldest military defense structure in the Philippines built in the early 17th century. It was under the command of the first governor of the colony, Miguel Lopez de Legazpi until its downfall when Filipino revolutionaries successfully infiltrated the structure at the end of the 19th century. It was then used as a stronghold and now serves as one of the most precious reminders of the region’s courage and heroism. This famous religious site is housed in a chapel near the city center. According to historians, it’s a wooden Christian cross mounted by the Spanish and Portuguese explorers in 1521 under the command of Ferdinand Magellan. According to locals, the cross possesses miraculous healing powers. Outside the chapel are women and children selling candles for offering, and older women singing songs of worship and good luck to those who are kind enough to offer donations in exchange for a ritualistic prayer-dancing. If your idea of fun is interacting with the locals and enjoying the unique and genuine vibe of the city, then Colon Street should be first in your itinerary. However, for first-time travelers, it’s advisable to experience this insider culture with a local who knows their way around the place – because it could get really crowded and overwhelming. 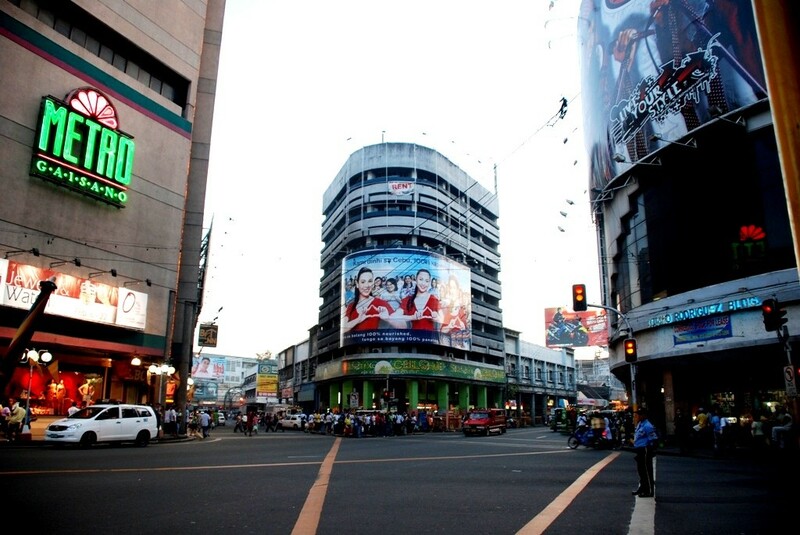 Colon Street is a historical place in Cebu City, and is known as the oldest and shortest national road in the country. It was named after the famous explorer, Christopher Columbus. At present, it’s a home to many local fashion stores, movie houses, old local restaurants, and many smaller establishments. Cebu City is a buzzing metropolis that has successfully kept its historical and nostalgic charm. Traveling to this part of the Philippines can be the most exciting and unforgettable getaway that you’ll ever experience, either for a family trip or a solo adventure. Speaking of shopping malls, did you know that the biggest mall in the world is China’s New South China Mall? 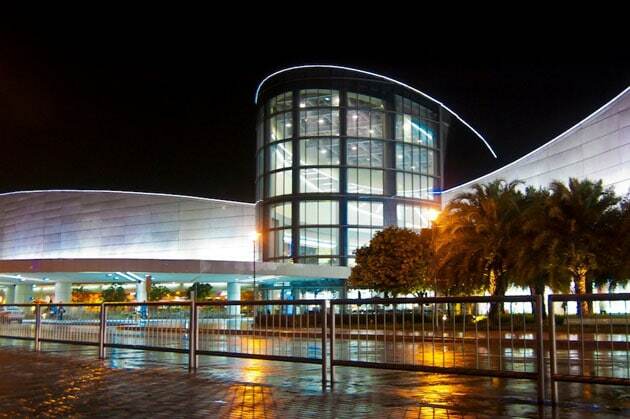 This shopping haven in Dongguan, China has a gross floor area (GFA) of 660,000 square meters. 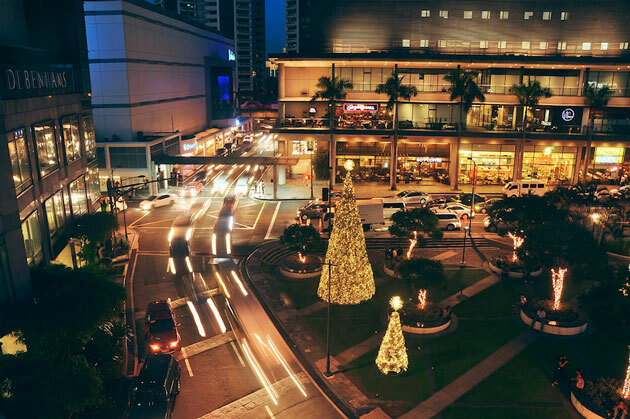 Spending leisure time in shopping centers, especially during weekends and public holidays, is a common phenomena in the Philippines. The locals seem to enjoy going out, hanging out, and shopping. For that reason, shopping malls can be easily spotted across the country. Amongst the long list of shopping malls, here are the top biggest ones. Known to be the first mall that introduced the locals to the lifestyle, this mall has been through several transformations since its first public opening in 1985. Currently nominated to be the country’s biggest mall and the world’s third, what started in an area of 125,000 sqm has now expanded to 498,000 sqm. It also houses more than one thousand retail stores and restaurants in addition to its 5,760 rooftop solar panels. This number one shopping mall really lives up to the concept of one stop shop. Notable to the first mall to have ice skating rink in the country, this shopping mall has been through several major expansion since its opening in 1991. The initial size of 330,000 sqm has been expanded to 474,000 sqm. With larger leasable area, it now caters more than one thousand outlets, ranging from fashion to dining. The mall has a maximum capacity of 4 million people. Located in the center of SM Seaside Complex is SM Seaside City Cebu. WIth 470,000 sqm floor area, this mall is among the world’s largest. What makes this mall special is the 16 lane bowling arena, Olympic sized ice rink and large screen cinema that can accomodate 350 seats. In addition to those recreational features is the 148 meter Seaside Tower. The mall was crowned as the world’s biggest when it was first introduced to public in 2006. The size of the mall floor area is the stagerring 406,962 sqm and there are four buildings comprising the mall: the main area, the entertainment section, and two car parks. 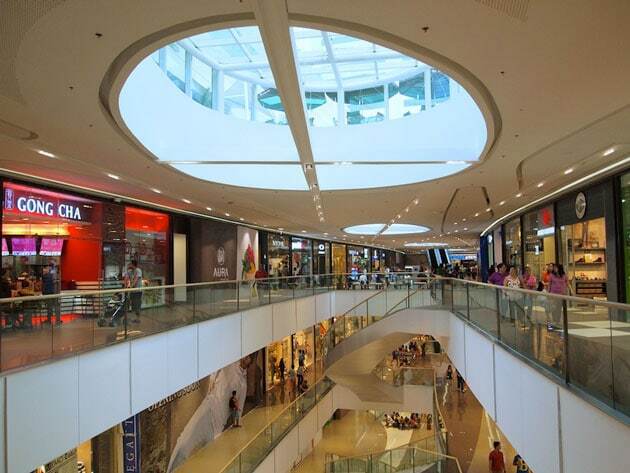 The availability of more than one thousand retail and dining outlets along with an Olympic sized ice rink and science discovery center called Exploreum has made SM Mall of Asia one unique shopping center. 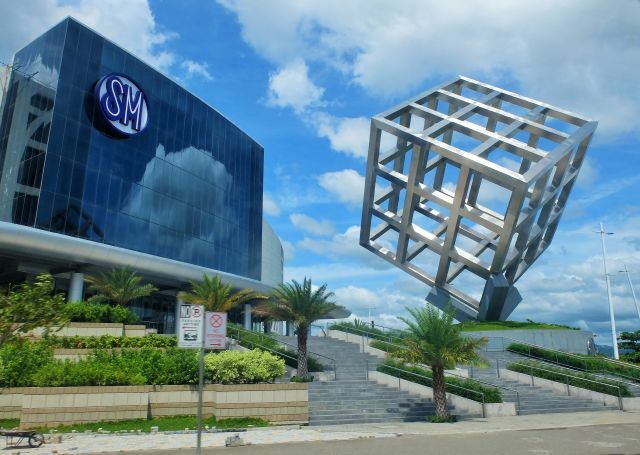 Better known as SM Cebu, this is the fourth mall of SM Prime Holdings. Having been through some major development, the 162,000 sqm initial size of the floor area went up to 269,000 in 2007. With the construction of the Northwing new building, the number of shopping and dining outlets has also gone up to almost 700. Built as an upscale shopping mall in Metro Manila, SM Aura Premier has the size of 251,000 sqm. Consisting of some high-end stores, restaurants, and bars, the mall connected with the 29 storey SM Aura Office Tower is a convenient place to spend leisure time. Complying with global green standards in terms of efficient use of energy and sustainability, this mall does represent the definition of its name: elegance. 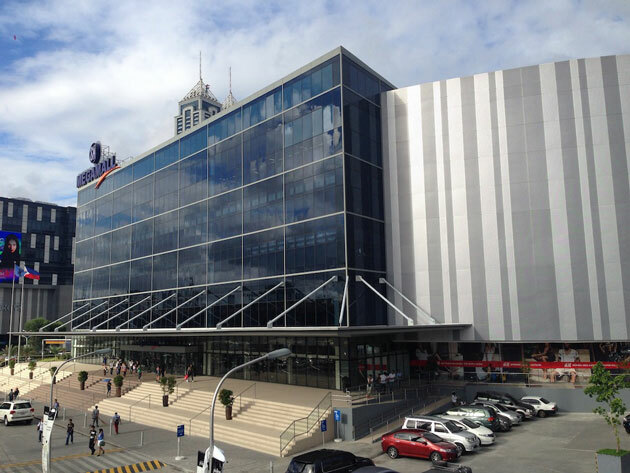 What was initially planned to be a part Makati Commercial Center has been transformed into a 250,000 sqm shopping mall. 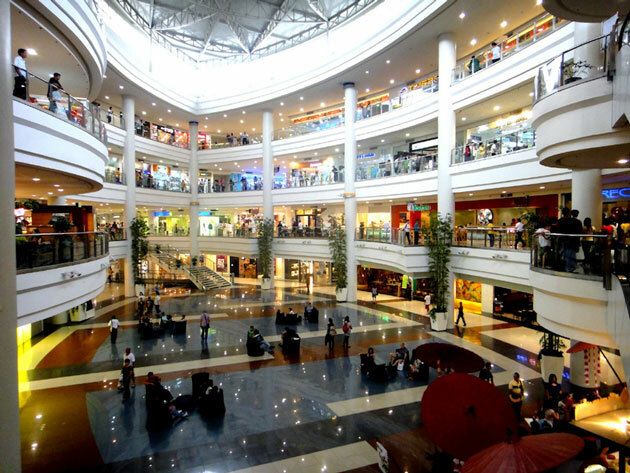 Starting its operation in 1992, the mall was then divided into three sections: Glorietta 1, 2 and 3. 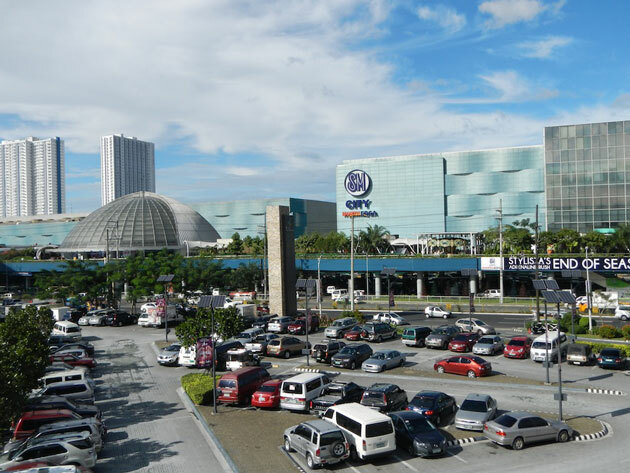 The mall has been through some changes since then: the addition of Glorietta 4 in 1998 and the stand-alone building of Glorietta 5 away from the other four sections. Managed by Ayala Malls, this mall provides a complete package of leisure entertainment: cinema, theme park, entertainment hub, etc. Consisting of five buildings, this mall began its operation in 250,000 sqm floor area in 1989. In 2002, the initial place, however, was reconstructed into the so-called Greenbelt 1, 2, and 3. 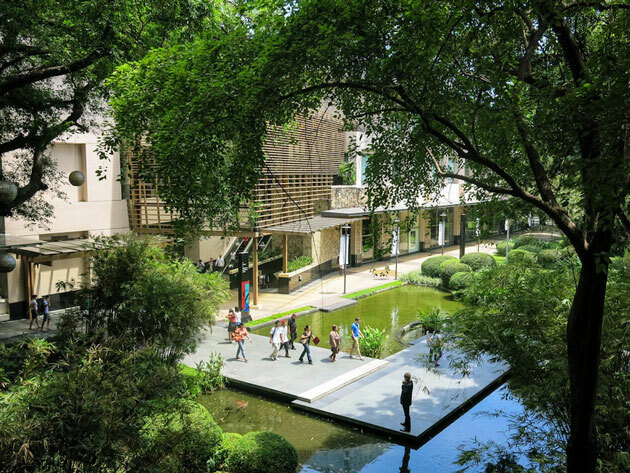 In two years’ time, Greenbelt 4 was open and three years after that, Greenbelt 5 was launched. Nowadays Greenbelt Mall is dominated by prominent brands and restaurants, although fast food counters and supply stores can still be found in Greenbelt 1. Completing the shopping complex is a park in its open space area. Claimed to be the biggest Robinsons mall with the development of its Padre Faura and Midtown wings in years 2000 and 2008, the size of the mall has reached 240,000 sqm. Spread on its seven floors are thousands of both local and international retail stores, restaurants, and entertainment outlets, such as bowling, billiard, and cinema. 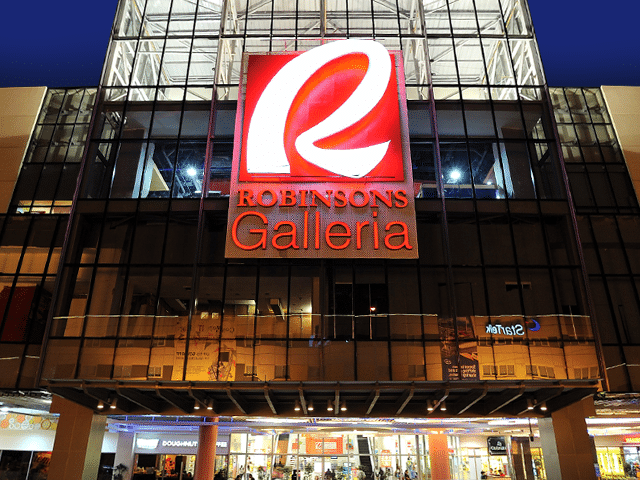 Back in the 1990, this was the first launched Robinsons mall. 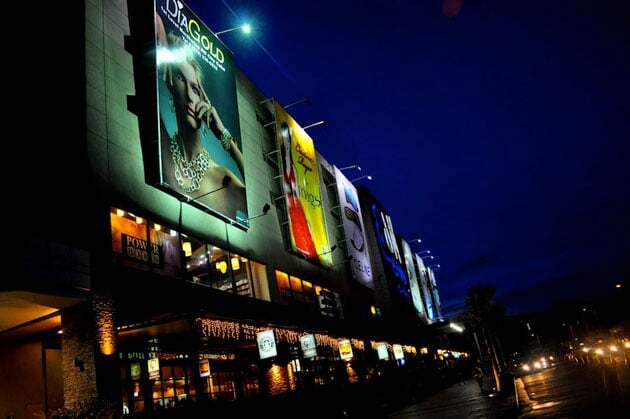 Now it also goes by the name Robinsons Galleria Ortigas due to its location, which is inside a mixed use complex lying on the corner of EDSA Ortigas Avenue. As the flagship of Robinsons Malls, this five storey mall is equipped with hundreds of stores, restaurants, as well as entertainment and service centers. 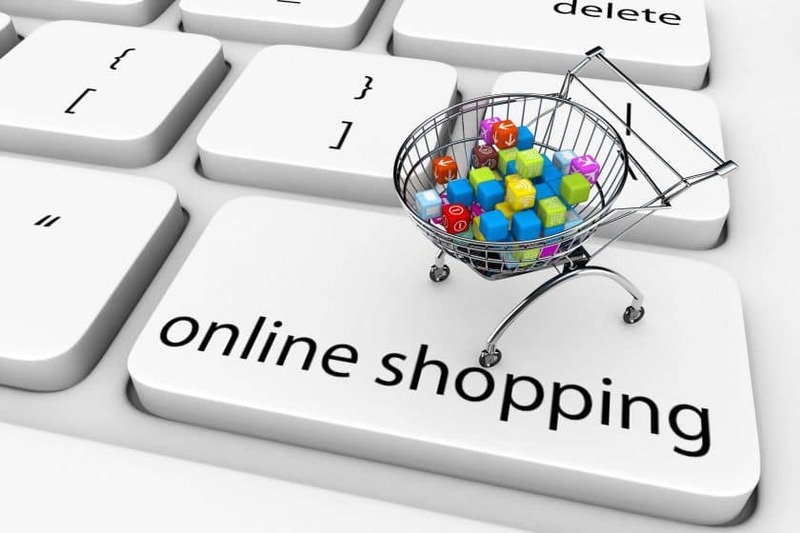 There is no question that for the past few years online shopping has grown more popular. The phenomenon has enabled so many new entrepreneurs to establish their businesses at lower cost — thanks to the virtual online retail stores and affordable marketing campaigns. Not only does it benefit businessmen, but it has also helped customers to shop through simple scrolling and a few clicks on their gadgets. As a matter of fact, customers’ satisfaction with the online products and services is the one thing that boosts the popularity of this new way of shopping. People in the Philippines are a part of those happy online shoppers. It is no wonder that there are at least these ten most visited e-commerce websites in the country. Serving as the one stop shopping solution in the Philippines, Malaysia, Singapore, Indonesia, Vietnam and Thailand, this site has been known as one of the online e-commerce giants in Southeast Asia. It offers a wide range of products, such as home appliances, gadgets and fashion. The products come from different brands and the site gives its customers several payment methods to choose from. With more than the estimated average monthly traffic of seventy million Internet users visiting the online marketplace, its dominance in the Philippines is undeniable. Due to the popularity, this site originally founded by Rocket Internet was then acquired by Alibaba in 2016. OLX Philippines is one of the biggest buy and sell community in the country. On OLX, users can sell and buy second-hand items – from used cars to gadgets or furniture. You can also find a house or condo for rent or for sale. With more than nine million monthly visitors, Shopee is the third most popular site in the Philippines. Providing a good marketplace for retailers to ‘meet’ buyers and help them settle the deals through its escrow system and customer reviews, purchases made on this online platform are considered trust worthy and thus, it encourages people to use its service. Philippine airline company Cebu Pacific launched in 1996, but took off in earnest as a low-cost carrier in the mid-2000s. It has since offered customers discounted etickets they can purchase online using a credit card. It was one of the early local ecommerce options in the Philippines, and continues to be patronized by consumers for its promos. Well known for its dominant market share in fashion retail industry, the site has been operating in various Asian countries: the Philippines, Singapore, Malaysia, Indonesia, Thailand, Vietnam, Hong Kong and Taiwan. The company’s partnership with global brands, like Mango and H&M, has made it possible to reach the fourth position of top shopping sites in the Philippines with website traffic at around three million every month. Who does not like coupons, discounted items and that sort of better deals? This e-commerce site accomodates such wishes. With its specialization in offering good deals for leisure, food, and travelling, it successfully expands to Indonesia and it is now also developing its operations inThailand. Reaching almost one million monthly traffic*, this virtual e-commerce platform specializing in electronic hardwares and gadgets is highly regarded as a part of the Globe Corporation, which is one of the prominent companies in the Philippines. Although it was originally created to be the meeting place for consumers, the site has been expanded to facilitate companies selling their products to customers in eBay stores. This creates more hectic traffic as many as 1,850,000 monthly visits. Quite similar to Villman Computers, CDR King, which is a local retail chain company, provides an official website for its customers to shop online. Reputed for its discounted offers on electronics, computer hardware, gadgets and the accessories, this site monthly traffic is at around 580,000. Providing imported goods from the USA and China, that are not available in the Philippines, to the people in the country, Galleon.ph is estimated to attract around 500,000 visitors per month. The benefit of shopping via this online platform is that even if the product you are looking for(from the USA or China) is not currently available on the web, you can send an email asking for help to get that specific product. As written on its web, the company promises to get the product for you as long as it is from either one of the two foreign countries. Another plus point of this site is that it applies the all in price, which already includes taxes, customs, and delivery. Having less visits at around 390,000 than CDR King, the online website highly focusing on gadgets, computer hardware, and mobile devices allows its customers to buy their products via the Internet in spite of the existence of its real retail shops. Just like any other online shop, WeeMall .com is a gateway for unique and branded products that goes from fashion to gadgets. It has various payment option platforms as well as same day delivery through Speed Delivery service. Although amusement parks are usually not the main focus of holidays in the Philippines, there are actually some which are definitely worth a visit. As the name suggests, this theme park enchants its visitors with opportunities to experience worlds made up of imagination and creativity, such as the world of pirates called Anchors Away and the world of outer space named as Space Shuttle. In addition, Discovery Theater and the Seventh Portal serving as the interactive education are available for people of all ages. 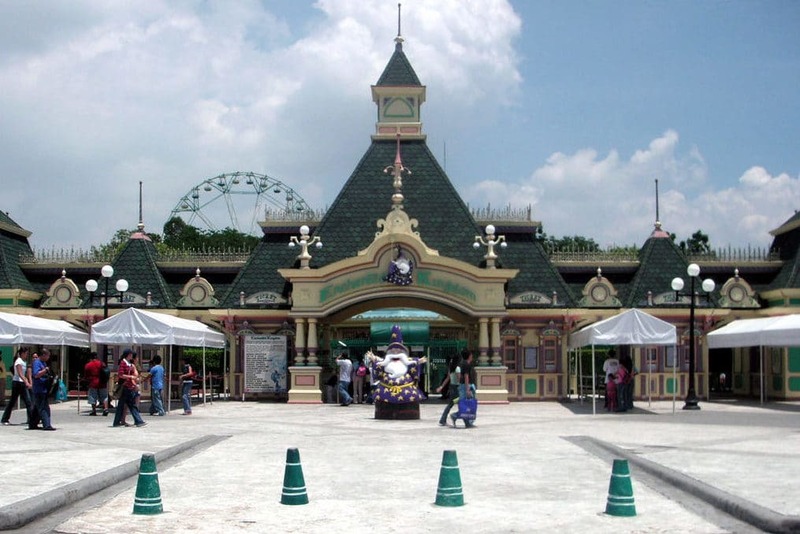 EK also hosts song and dance performances, animal encounters, and a fireworks show. 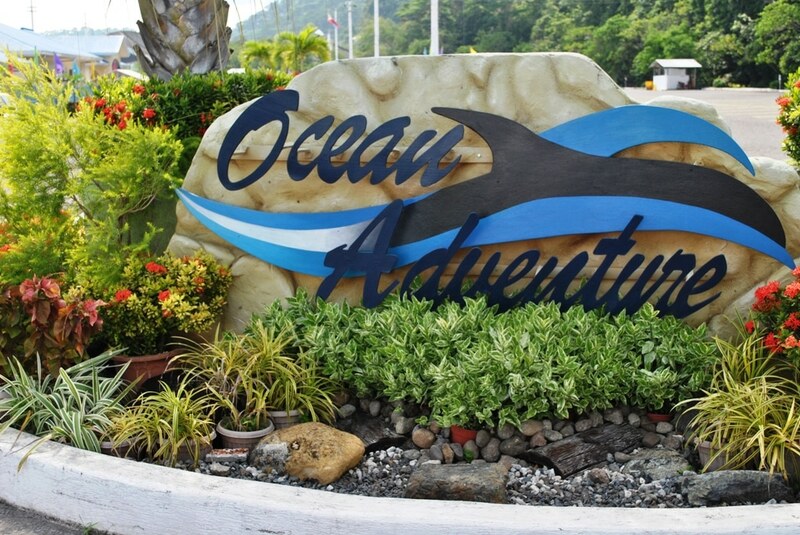 As the only ocean theme park in the country, the place offers the perfect combination of fun and learning experiences. The most notable fun, educational activity in the park is called Mermaid Swim Experience, in which the participants are dressed up like mermaids and learn how to swim inside the big tanks. Another thing that should not be missed is the Symphony Fountain Show. Adrenaline seekers would definitely love this amusement park because the rides are known to be quite extreme. Some of the popular adrenaline pumping rides are Star Flyer, which is the only inverted roller coaster in the Philippines; Viking, which allows its riders to experience the rocking sensation similar to the one caused by a stormy sea; and Star Frisbee, in which spinning seats are taken up to dizzying heights. Other rides to enjoy are the Snow World for those who simply want to chill out and rides for those who fancy horror called Dungeon and Gabi ng Lagim. 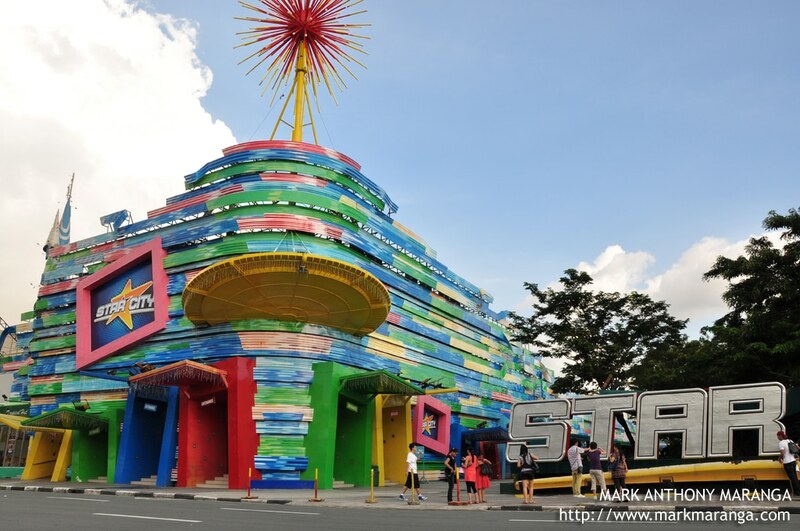 Located in Subic is an amusement park that is the exact opposite of Star City. Visiting the park can bring joy without the need to experience the extreme. 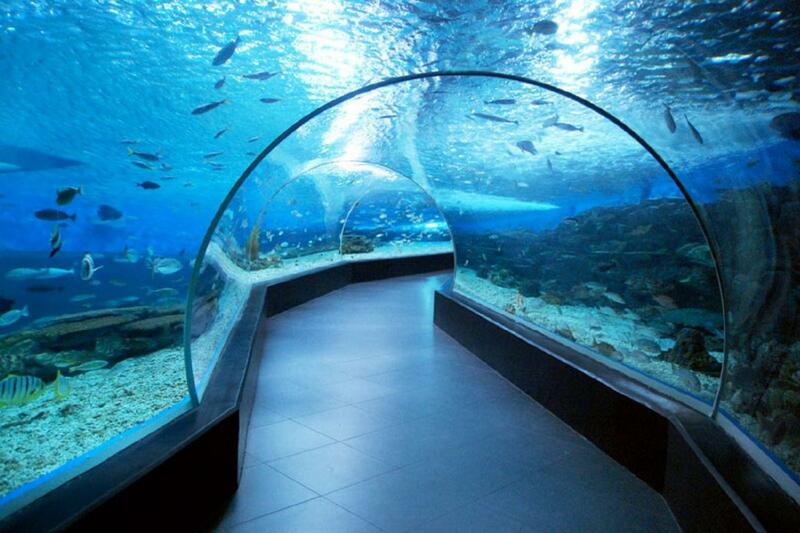 Giving a chance for its visitors to interact with different sea animals directly, it is definitely a must visit for those who fancy engaging with the animals. Apart from the direct interaction, there are also animal shows, in which whales, dolphins and some other sea creatures perform amusing attractions for the visitors. 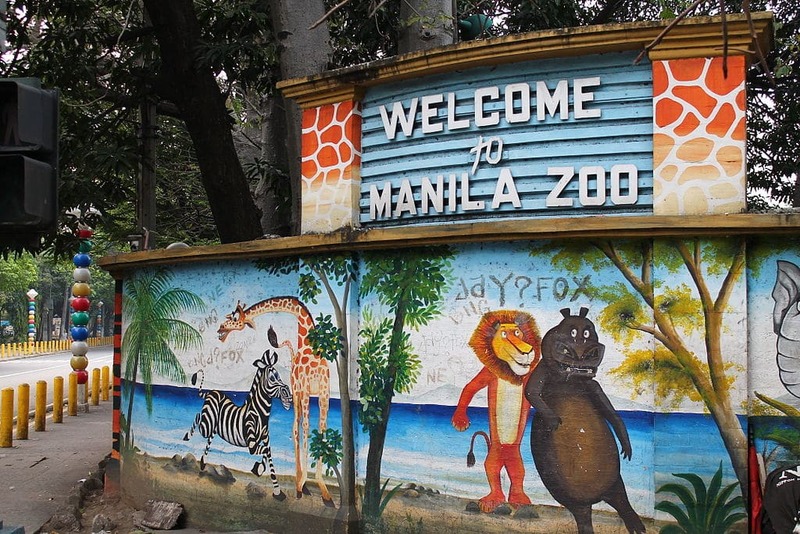 Better known as Manila Zoo, the site started its operation in 1959 and thus, it is regarded as one of the country’s oldest recreational parks. This 5,5 ha zoo is reported to have approximately 500 animals, most of which are mammal species. With its wide collections of flora and fauna endemic to the Philippines, like bearcat and macaques, some comment that the park looks more like a sanctuary. Apart from the animal display, playgrounds, boats and souvenir shops are available in the zoo. Popular to be the home to more than three thousand wildlife species, the zoo is as large as 7,5 hectares, which is the largest in the Philippines. Conducting internal conservation programs, the zoo is trying to save the lives of endangered animals. Not only that, it has been striving to bring more awareness of the country’s wildlife diversity to its visitors. 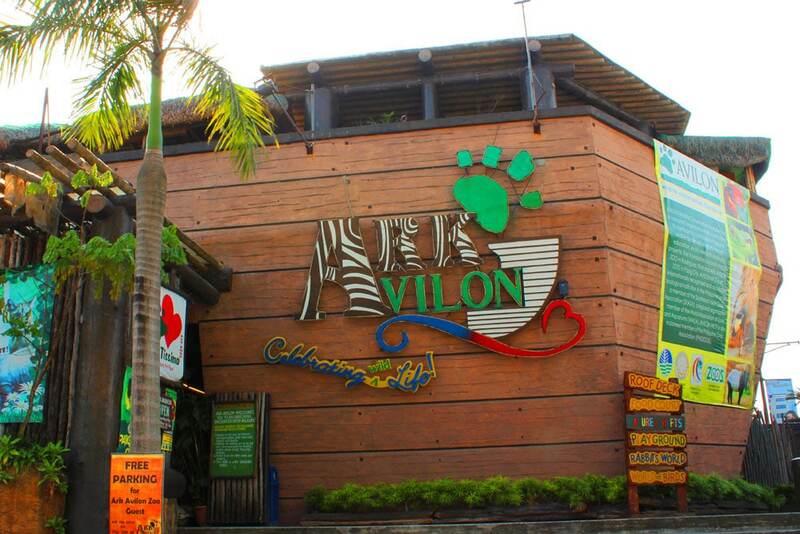 In Avilon Zoo, you may feed some of the animals, and pose in front of the camera with its friendly primate, Trixie. This is one of the rare places where one of the gigantic Ferris wheels can be found. 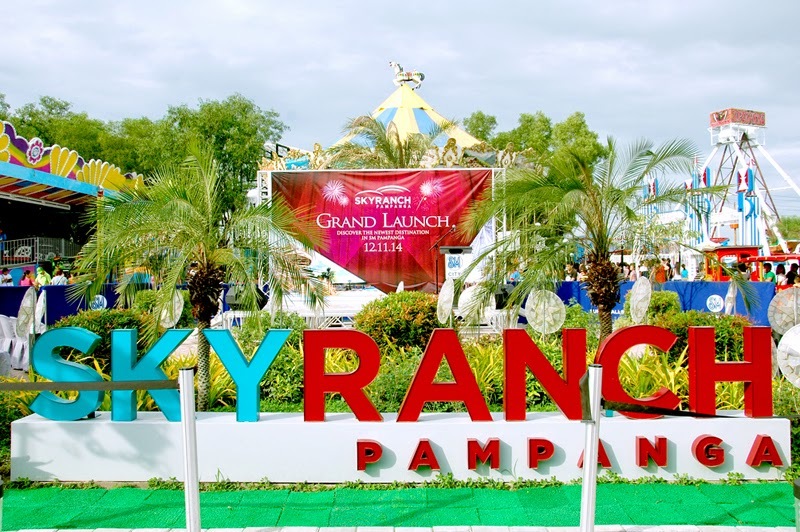 The ride called the Sky Eye allows its visitors to experience getting on the Ferris wheel gondola, being lifted up 63 meter high in the air while enjoying the scenery of Taal Volcano and its Lake for ten minutes. Should such scenery be your thing, the ride called Sky Cruiser will allow you to further enjoy the views of the lake and volcano by getting on the pedal powered aerial vehicles. There is also Zipline, which will not only give you a different angle of the scenic views, but will also give you a thrill through its 300 meter zipline. Despite its recent launch, this amusement park is a strong competitor to more established ones. 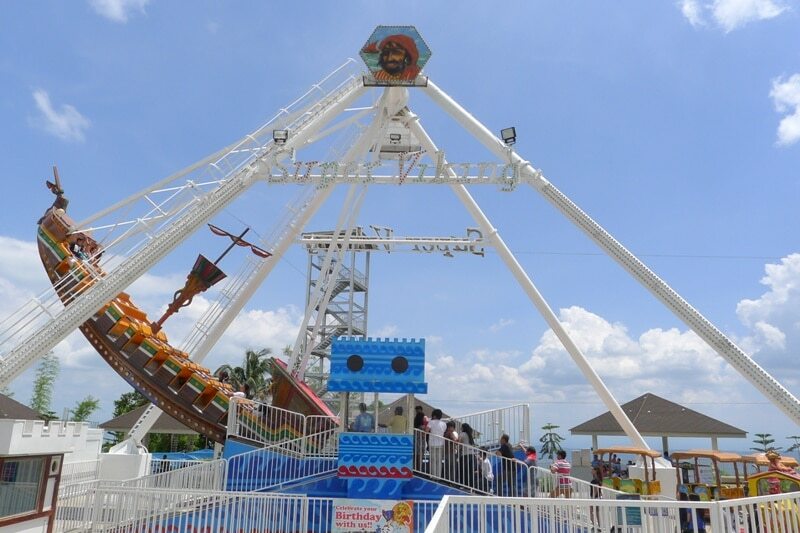 Quite similar to the one in Tagaytay, its popular ride is the enormous Ferris wheel called the Pampanga Eye. Other than that, there are the so-called Double Decker Carousel, Bubble O Fun, Jump Around and Wonderflight, which are aimed at entertaining little kids, as well as booths around the park, in which the players can get prizes when they win the games. 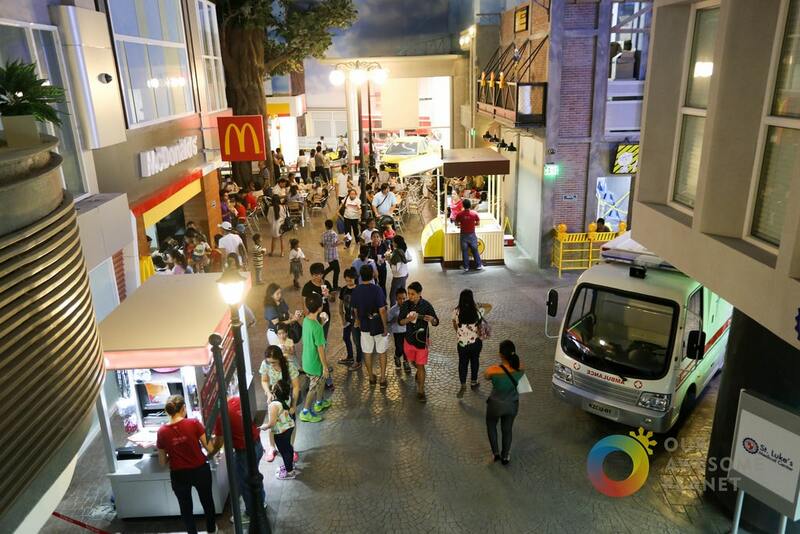 What makes Kidzania Manila unique to most theme parks out there is that it is specially constructed for children. Serving as the edutainment park for kids aged four to fourteen, this theme park allows children to pretend taking up adult roles, such as being a doctor, fireman, or a cook. The tools related to the occupations have been made to meet the average size of a child. Thus, it makes the experience more fun and friendly for kids. If you want to see exotic animals up close, one of the places you can go to is Zoobic Safari. 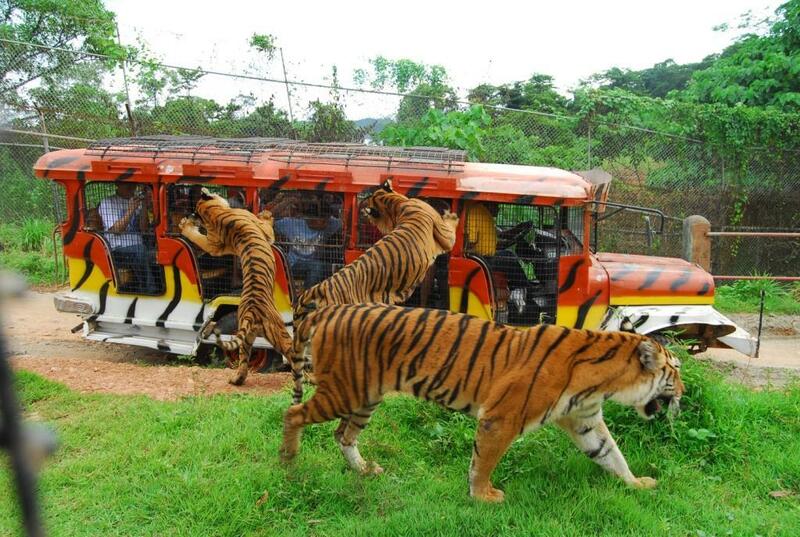 They boast of being “the only tiger safari in the Philippines” with more than 40 tigers in the park. The 25-ha. amusement park offers 11 attractions where guests can see python snakes, iguana lizards, guinea pigs, and other animals.